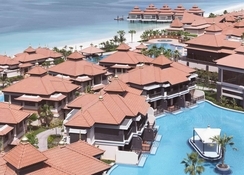 Anantara the Palm Dubai Resort, claiming to be UAE’s only Over Water Villas, redefines luxurious living on the beachfront, blending Asian inspired architecture, a scenic setting and warm Middle Eastern hospitality to make guests feel at home. Strategically located on the Palm Jumeirah’s eastern crescent, with access to 400m of private beach, rooms offering access to three lovely lagoons, a gorgeous shoreline infinity pool, this is the ultimate chic accommodation to enjoy your Dubai City Break with tranquillity. Best of culinary experience at its delightful restaurants offering excellent views of the manmade island escape and the sea, 323 opulent rooms with chic furnishings and modern amenities and a blissfully invigorating Anantara spa await guests for an unforgettable stay in the cultural melting spot of Dubai. 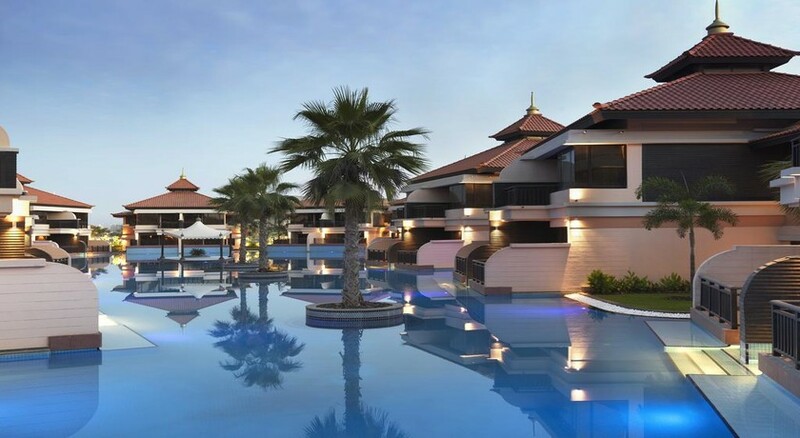 Located on the East Crescent of Palm Jumeirah, the largest man-made island in Dubai, Anantara The Palm Dubai Resort is connected by a 300m bridge to the mainland. The busy Sheikh Zayed Road is 1km away, the Dubai Marina is in close proximity. The Aquaventure Waterpark and Emirates Golf Club are 5km and 18km respectively. The hotel is 41.5km from Dubai International Airport, just 45 minutes’ drive. 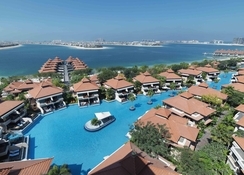 Anantara The Palm Dubai Resort offers 293 luxurious guestrooms and opulent villas, including some built over the water and offering a peak of the ocean from their glass floors. Tastefully furnished rooms with modern amenities and amazingly scenic views of the sea or the lagoons redefine luxurious living with tranquillity. The rooms feature private terrace/balconies, large windows allowing natural light and stunning views, smart satellite TVs, tea/coffee maker and free Wi-Fi. Upgraded rooms and villas may have direct pool access, Gulf views, glass floors, additional bedrooms and/or infinity pools. The rooms come in categories like Premier Lagoon View Room, Deluxe Lagoon View Room, Premier Lagoon Access Room, Deluxe Lagoon Access Room, Deluxe Family Lagoon Access Room, One Bedroom Beach Pool Villa, One Bedroom Over Water Villa and Anantara Two Bedroom Beach Pool Villa. Anantara The Palm Dubai Resort invites you to celebrate gastronomy with a riveting diversity of cuisines that are regional and international. There is a clutch of restaurants like Crescendo (regional), Mekong (Asian), Bushman’s Restaurant & Bar (barbeque), The Beach House (Med), Spice Spoons (Thai cooking) and the Revo Café and The Lotus Lounge. Indulge your senses at the blissful and luxuriant Anantara Spa equipped with 24 treatment rooms, plus a holistic cocoon room, Thai massage suite, Ayurveda room which offers separate sections for men, women and couples. There are showers, sauna, beauty salons and steam rooms too. The hotel offers Dubai’s first Thai longtail boat shuttle (charges apply) to Dubai Marina. There’s a well-equipped fitness studio, facilities for water sports and two tennis courts. For the younger guests there’s a Kid’s Club and a Teen’s Club.